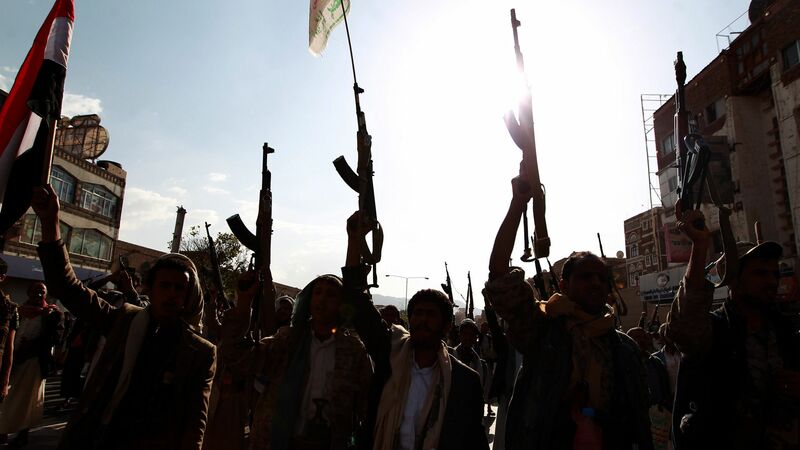 The Saudi-backed coalition, which receives U.S. support, has been working alongside al-Qaeda militants as it fights the Houthi rebels in Yemen, the Associated Press reports. Why it matters: Fighting al-Qaeda has been a primary goal of the U.S. military in Yemen, which faces what has been called the world's worst humanitarian crisis. But according to the AP, the military has looked the other way in some instances as deals were made with al-Qaeda fighters to clear out certain areas in the country. The U.S. is aligned with the the Saudi-backed coalition in eliminating fighters from al-Qaeda in the Arabian Peninsula (AQAP) — "the most dangerous branch of the terror network that carried out the 9/11 attacks." At the same time, the coalition is fighting the Iranian-backed Houthi rebels. Per the AP, AQAP is "effectively on the same side" as the coalition in their fight against the rebels, and by extension on the same side as the U.S.
Al-Qaeda militants have been paid off to evacuate certain areas that were being targeted by the coalition, the AP reports. In one instance, al-Qaeda fighters left major port city Mukalla after being "guaranteed a safe route and allowed to keep weapons and cash looted from the city." Another deal allowed militants to leave six towns in the Abyan region; they were assured that the coalition and U.S. would "cease all bombings as AQAP pulled out with its weapons," five tribal mediators involved in the negotiations told the AP. AQAP isn't seen as an international terror organization in Yemen, the AP reports, but "simply another faction on the ground." They've aligned with the coalition out of mutual disdain for the Houthis, and are "present on all major front lines fighting the rebels." Two primary coalition-backed commanders are allied with al-Qaeda, per the AP. The bottom line: Michael Horton, a fellow at the Jamestown Foundation, told the AP that the fight against Iranian expansion takes priority for the U.S. in Yemen. Quote"Elements of the U.S. military are clearly aware that much of what the U.S. is doing in Yemen is aiding AQAP... However, supporting the UAE and the Kingdom of Saudi Arabia against what the U.S. views as Iranian expansionism takes priority over battling AQAP and even stabilizing Yemen."